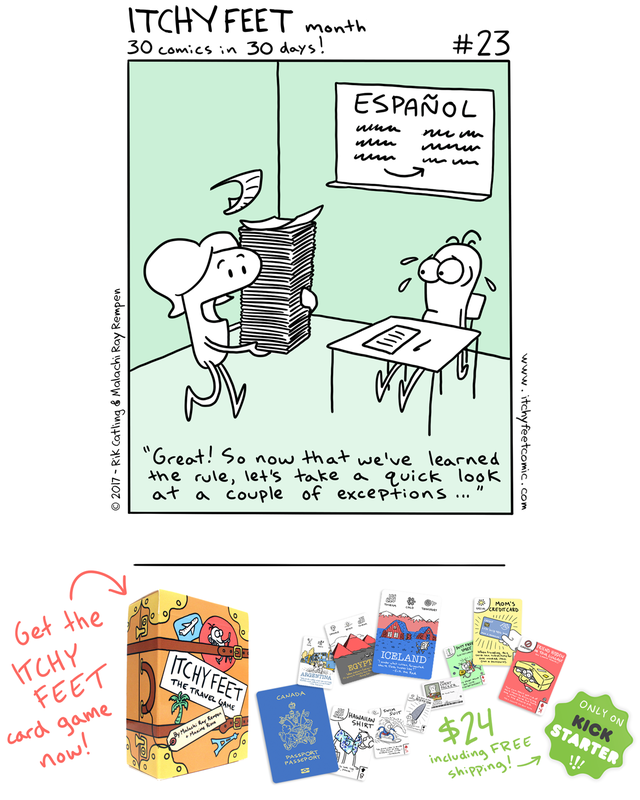 As someone who only remembers my obligatory Spanish I and II classes, this definitely rings true for me. I still know the song for the irregular preterites they taught us: "Tener es tuve, estar estuve..." but I couldn't tell you what it means now, or even how to conjugate regular preterites. It's been too long ago, but I still remember the stress of having to learn this before forgetting it next week. Dude, Spanish rules are one of the most consistent ones out there. The very fact that you can enumerate exceptions to the rules is alrady more than what English offers you. This would have been funnier if you had used German, for example. I agree that English is way worse but in my experience German is pretty damn straightforward. Actually I think it would be best if the name of the language was just left off completely, then people could assume it's about the language they're learning...! Pff, English has way more. Like, "I before E excpet after C" There's one exception already. And take, for example, the word rein. Or reign. More than one exception to the exception. The rest of the mneumonic is: "I before E except after C, or when sounding as "a" as in neighbor and weigh." That's wierd. No wonder foriegners have such a hard time with the spelling. Iether way, it doesn't seem to be a rule you can just use at your liesure, even if you don't want to forfiet it entirely. I'm of course bieng at the hieght of facetiousness. Excuse me! As a 100% Spanish - English bilingual I can say that while Spanish does have some exceptions, English is mostly ALL exceptions. Most frequently used verbs are irregular. Spelling / pronunciation are totally inconsistent. Same word, many meanings. Same word, same spelling, different pronunciation for different meanings. Pronunciation in various english-speaking countries and regions can be wildly different. English doesn't even have a proper future tense. It has to make it up with a phrase: I will eat or I'm going to eat. Also, yua have to have the pronoun attached or you don't know who the verb is aimed at: "Run" could be I/You/We/You/They run or even a noun (I went on a run)!